Italian niche line Bois 1920 will launch Come il Sole. Come il Sole is a followup to 2008's Come La Luna. A mysterious and deep fragrance. The first refined touches of Bergamot Essence and sparkling Cherry "pearls" lead to a precious and contrasting heart, composed by a noble Jasmine, Carnation, Lily of the Valley and Ylang Ylang bouquet. The rich and unedited drydown with its memorable silage is characterized by Essences of Vetiver, Patchouli, Oud, Perou Balsam, Styrax, Cistus and Benzoin, which blend to Tonka Bean and Vanilla Absolutes, offering a magnificent and enveloping allure. 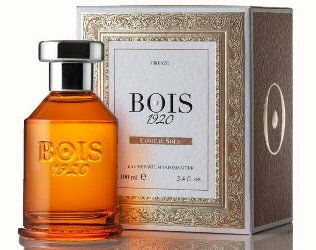 Bois 1920 Come il Sole will be available in 100 ml Eau de Parfum. It sounds interesting but I always approach any perfume with vanilla in it with caution. Now if someone could get vanilla to actually smell like the beans in a pod, I may retract my comment. Lol. But if it smells like a magnificent and enveloping allure?? The sparkling cherry “Pearls” make me uncomfortable. What are “Pearls”? They sound freaky. Yeah, beats me what that means!